Bloating and indigestion is very common after a big meal and rich food. Instead of popping pills to ease out the discomfort, 15minutes of yoga will do the wonder. A combination of yogic exercise and deep breathing that stretches the abdominal organs, helps weed out the accumulated gas and toxins in various parts of the body. A good bowel movement is the key to good health. The indigestion of food or Intense constipation is the root cause of several troubles in the body. Several yogic asana not only strengthens and tones the body but also increases the rate of metabolism of the body. This sequence of yoga relieves a wide range of digestive discomfort like gas, bloating, constipation. It is one asan which can be done soon after eating a meal it facilitates digestion. It will stretch out your belly and ease stomach cramps. Sit down on your heels and lean back, placing your palms about eight inches behind you, with your fingertips pointing away from you. Press your hands into the ground, lift your chest and arch your back. You should feel your hips pushing into your heels. Increase the stretch by lowering your head behind you. Feel the stretch in your throat and chest. Hold for five breaths, and then sit up. It facilitates digestion and also gives relieves in lower back pain. Bring your hands beneath your shoulders and knees beneath your hips. Inhale as you bring your stomach toward the earth and lift your heart and hips to the sky into Bitilasana (Cow Pose). Spread across your shoulders. Exhale as you round your upper back toward the sky, dropping your gaze to your navel and pressing your hands and feet into the earth in Marjaryasana (Cat Pose). Continue for 10 rounds. Breathing deeply in these poses massages your organs as you alternately compress and lengthen the intestines. It pumps fresh blood to the cells, which are responsible for healthy gut function. Stand in an upright position and Spread the legs 3 to 4 feet apart, toes pointing forward. With an inhalation, raise the arms sideways to the shoulder level, palms facing down. Do not bend either forward or backward; keep the knees and the elbows locked; the left arm is straightened up, in line with the right hand, palm facing forward. While stretching the sides of the body, the waist is made very flexible and reduces waistline flab. Come onto your hands and knees as if you were moving into Cat-Cow pose. Then keeping your hips where they are, move your hands forward. Release your head onto the floor or a block and allow gravity to open your heart. 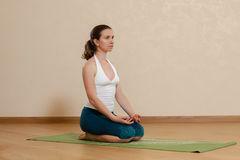 Uttan Shishosan pose is very useful for stretching the belly to relieve cramps after a large meal. Place your feet flat on the floor as close to your sitting bones as possible. Exhale and press your inner feet and arms into the floor while stretching your knees forward. Take 10 deep breaths here, then slowly roll your spine down to release. It delivers fresh blood to the heart and relieving any fatigue that may be caused by poor digestion. Hug your right knee in toward the right side of your ribcage. Keep pressing your straight left leg into the earth as you clasp your hands around your right shin to pull it closer to the floor. Hold for 1 to 2 minutes. Repeat on the other side. This asan stimulates the nerves to aid elimination and gas release. Caution: It is recommended that all the asan should be practiced under guided instruction.